“Watch your step! There’s a 1958 Chrysler 300D parked in the cow pasture,” said Dennis. I ducked under the barbed wire fence and wove my way into a thicket of tall pine trees in north Alabama. I followed the owner toward an 18-foot-long, island of finned-decay. 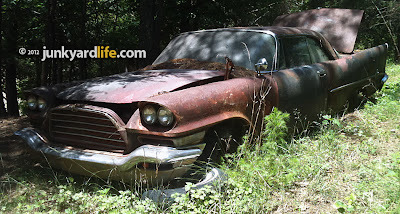 Resting on a bed of pine needles sat the rusting hulk of a 1958 Chrysler 300D. One-of-618 hardtop coupes built for the 1958 model year. 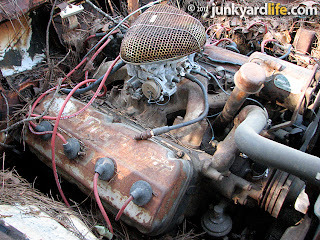 A 392-cubic inch Hemi lives in the engine bay and original 300D hubcaps are scattered inside the trunk. Unbelievable. 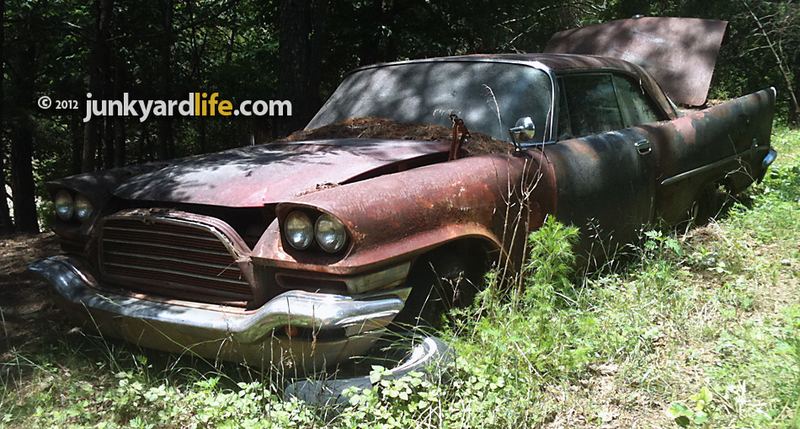 1958 Chrysler 300D coupes in #1 condition have sold for more than $85,000 this year. This ’58 300 is a massive chunk of oxidized steel that would make automotive designer, Virgil Exner weep. The huge fins that Exner designed on the "Forward Look" platform are just as impressive today as they were when they first rolled off the assembly line on 1957 Chrysler 300Cs. A 1958 300D cost over $5,000 when new and came equipped with two, four-barrel carburetors or Bendix electronic fuel-injection on the Hemi-headed engine. Those power plants made 380hp and 390hp respectively. Chrysler built the fastest, most expensive and most powerful American production cars in 1958. These were cars for the rich and famous. 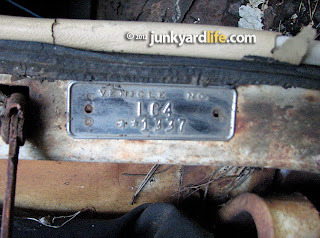 1958 marked last year for the Chrysler FirePower Hemi 392 in the 300 series. Less than 200 Chrysler 300D coupes are known to exist according to chrysler300club.com. 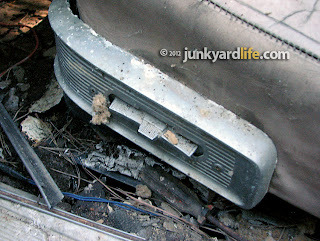 That's a shame because nature has taken a toll during this 300D's 54-year life. The floor pans, trunk and body panels are nightmare. Swiss cheese has fewer holes and the decay doesn’t get better behind the glass. The interior matches the ugly on the outside. 1958 Chrysler 300Ds carried 4,305 lbs. on a 126-inch wheelbase. Dennis, the owner of the 300D, is a hard-working paint and body man. 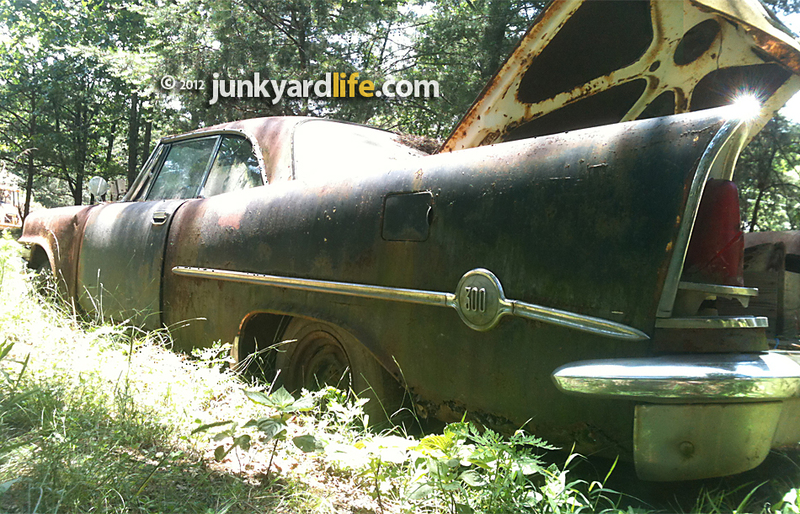 Several years ago Dennis made a trade for the weather-worn ’58 Chrysler. Dennis has plans to use the 392-cu. inch Hemi engine in his 1931 Plymouth rat rod. 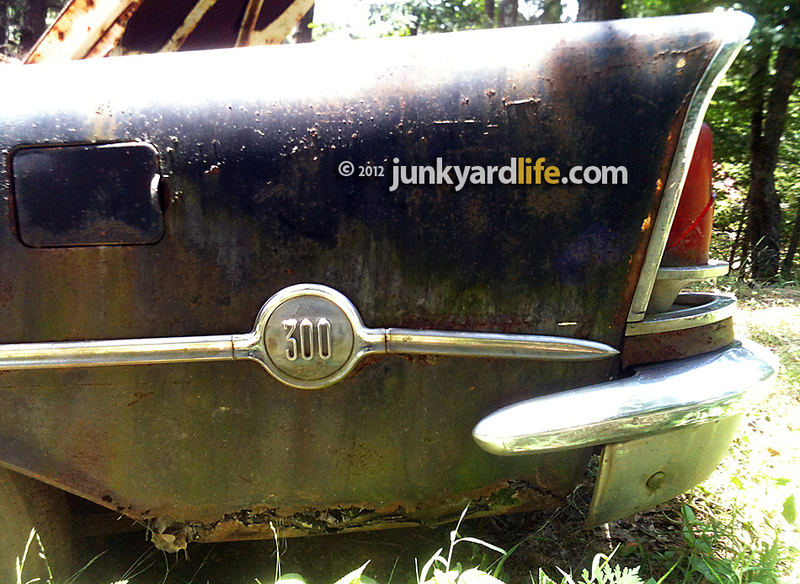 The rusted remains of the 1958 300D are “put out to pasture,” as they say, while the rat rod project sits on the back burner. Time is not on the 300D's side. 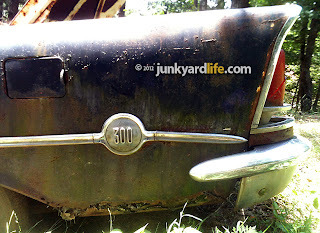 Do you think this 300D should be saved or parted out for the rat rod? Leave a comment, maybe Dennis will listen to your advice? 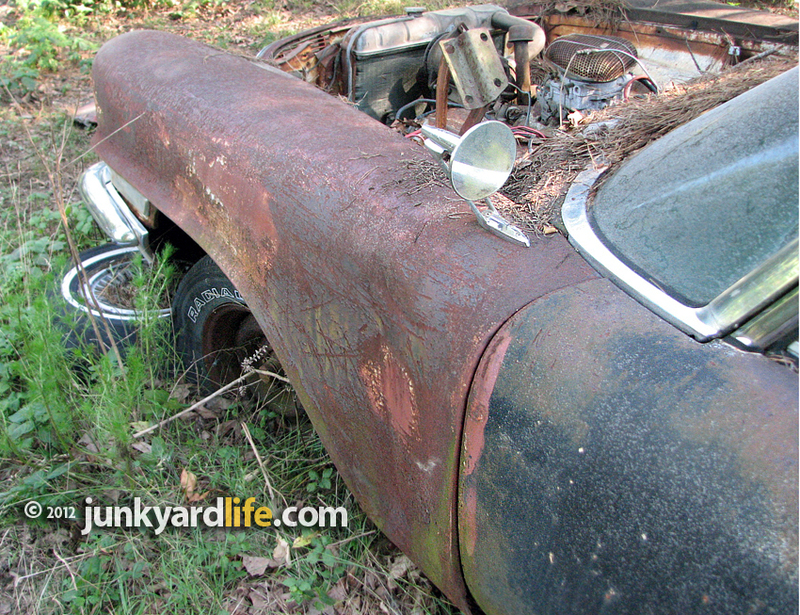 Do you know where a classic or muscle car is parked in the weeds, send photos and an address. We’re on the way!? Send emails to junkyardbull@gmail.com. 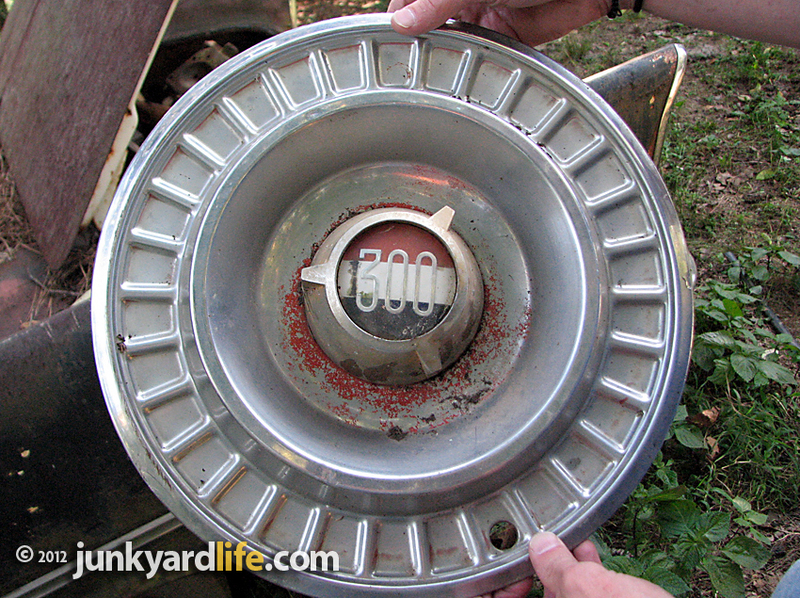 1958 Chrysler 300D hubcaps remain in trunk. The 300D's hood, a crucial part, is missing along with the rear seat. TorqueFlight three-speed auto transmissions were standard on 1958 300Ds. 1958 Chrysler 300Ds were loaded with options like 6-way power seats. 300 medallions were a staple of Chrysler's "letter cars"
1958 Chrysler 300 tail light lenses were smaller than on the ’57 model. Wide-mouth, egg crate grille and 4 headlights signaled a new era at Chrysler. Agree with anonymous. 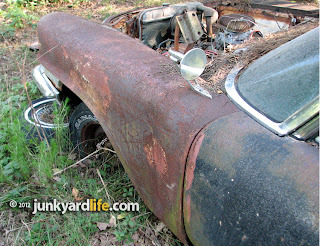 If Dennis cannot restore it, he should sell it to someone who can afford to. Would be a shame to part out such a rare car.